Given how much I've come to rely upon Windows Server 2012 Essentials for my daily PC backups, it was good to see the product line not only being continued, but growing in breadth and capabilities. And a bit of Hyper-V related news too, giving us a glympse of Microsoft's strategy going forward. At TechEd North America 2013, Microsoft announced that Windows 2012 R2 Essentials is no longer the Red Headed Step child of Server land but is an actual role on Windows 2012 R2 Standard and DataCenter editions. with a nice datasheet and overview white paper mentioned in the the related article, TechEd: Server Essentials 2012 R2 Announcement. The public preview of Windows Server 2012 R2 Essentials (as a stand-alone product) as well as the Essentials Server role included in both Standard server and Datacenter edition will be able to be viewed with the public preview of Windows Server 2012 R2 which will be out around the time of the BUILD conference the end of June. 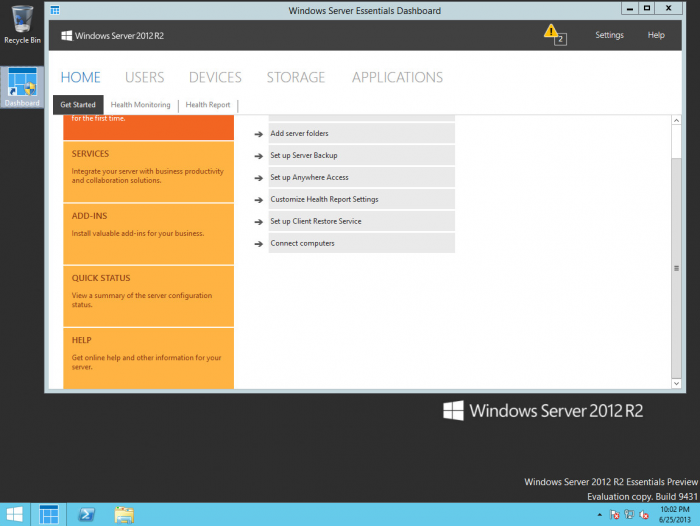 Windows Server 2012 R2 Essentials as its own Hyper-V host. With previous versions of the Windows Server Essentials edition, it was necessary to obtain a hypervisor separately in order to run as a virtual machine—options included the free Microsoft Hyper-V Server or using Windows Server Standard edition to run Hyper-V. With Windows Server 2012 R2 Essentials, the product licensing terms have been expanded to enable you to run one operating system instance on the physical server in order to run Hyper-V, plus a second instance on that server in order to run Essentials as a virtual machine. Installation wizards have also been created to simplify the process of deploying as a virtual machine by automating the steps necessary to set up and configure the host server environment. This makes it easier than ever before to take advantage of Hyper-V and its features, such as Live Migration and Hyper-V Replica. 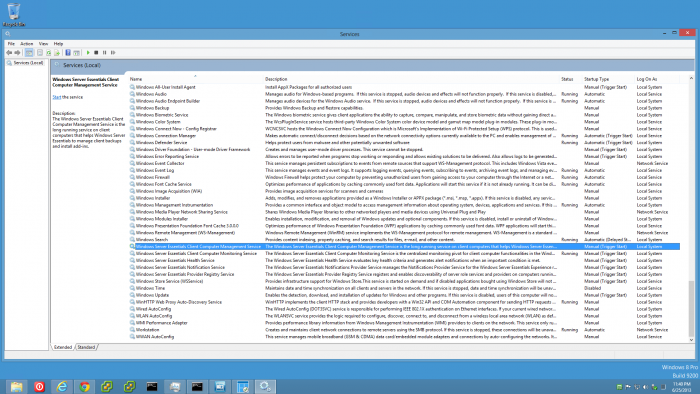 Then on June 7th, there was Paul Thurrott's Windows Server 2012 Essentials R2 Preview, My favorite Windows Server version is getting a big upgrade in R2, with a lot of great information and screenshots, including the promise of client connector improvements. Any potential for a simpler client connector install than what I demonstrated here sounds like a good thing, looking forward to being able to try out the code, to find out for myself. And yourselves. But what really could change everything for home build folks would be the ability to use Hyper-V with the Essentials Role. 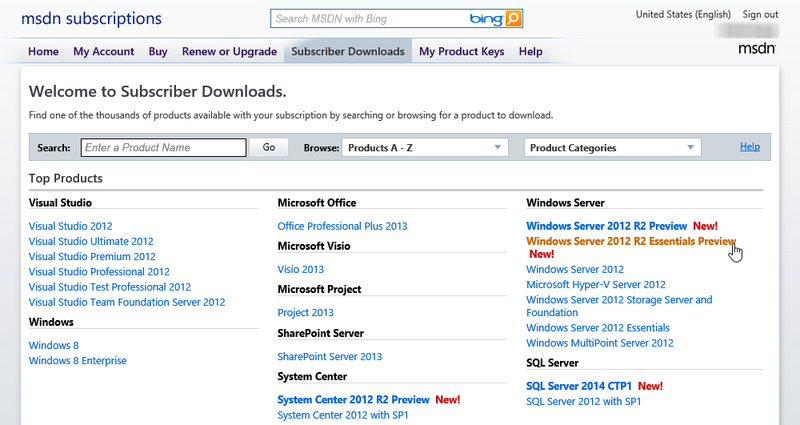 That piece really would make it much simpler for a typical TechNet / MSDN subscriber to kick the tires, all on one system. Click anywhere on the picture above, to sign-up to be notified. Here's an excerpt of the email that arrived a few hours after the download was first available. Guess 1pm eastern time is no longer the magic time for new stuff? Will be interesting to see when Windows 8.1 arrives on June 26, 2013. 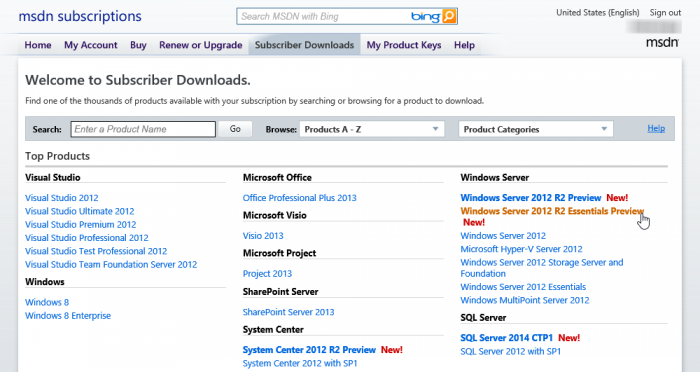 Thanks for downloading and trying Windows Server 2012 R2 Essentials Preview. We've put together some great resources to get you started. These, and other valuable evaluation tools, can be found online at our Resource Page. Looking very much like prior releases, only with a start button and R2 graphic. But during my preliminary tests today, I have good news and not so good news to report. a) skipping the domain join on the client connector installation still works! (same registry tweak), detailed at TinkerTry.com/ws2012e-connector. b) if you do skip the domain join, the potential DNS issue is still there! 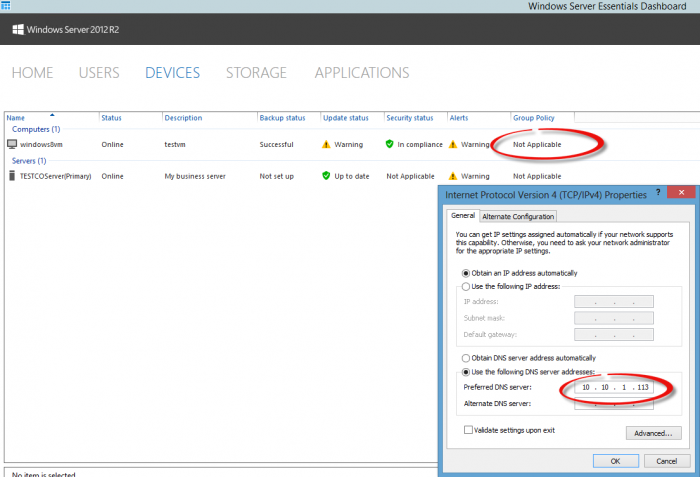 testing of DNS after the client connector is installed indicates that it still changes your DHCP configuration for TCP/IP, hard-coding the IP of the DNS to your R2 system. So for those of you that skip the domain join, you may still want to follow the detailed work-around instructions at TinkerTry.com/ws2012e-dns-fix. c) where is the service to stop the DNS from getting hard-coded again (after you go back to DHCP)? This will take a deeper dive to figure out. "...but before I installed the 2012E connector I skipped the domain join using the Technet regedit and my DNS setting is still set for "automatic" and is not hard-coded to the server like you suggest..."
and double-clicked it to run the installer, which went quite quickly. My Windows 8 DNS configuration was automatically hard-coded right away, no reboot or anything. I'll need to try to replicate this again, and record it, I suppose. Well, turns out Windows 8.1 Preview can also skip-domain-join when installing the Windows Server 2012 R2 Essentials client connector, and it's DNS setting was left alone, demonstrated in the walk-through video below. This is interesting. See also new comments at previously mentioned forum discussion here.